Important Note: I am not using the CryEngine anymore, so this page is up “as-is”. It is probably very flawed and incomplete. And I won’t be able to provide any help about this topic, sorry. But feel free to discuss things in the comments. This very basic tutorial will help you setting up a basic AI behavior for melee combat. Meaning that it will yield a behavior that you can assign to your entity character. The entity starts in idle mode, then seeks the player when it enters its field of view, starts approaching until a certain distance and starts attacking once it’s in range for its melee attack to make contact. First I want to thank the_grim and all the community members from crydev.org for making a lot of this information available in the first place. This is only possible because of what I learned from them. Now let’s move on to the topic at hand! In this case I’ll name the file “Swordsman.xml” and I’ll save it in …/Game/Scripts/AI/SelectionTrees/. This is where we define what should happen and when. Notice that you’ll recognize the names of the GoalPipes, since they’re the ones we declared as “leaves” in the Selection Tree. I’ll name this file “GoalPipesSwordsman.xml” and I’ll save it in …/Game/Scripts/AI/GoalPipes/. 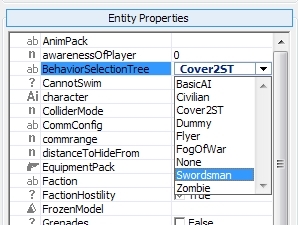 We need to save those files in a folder with the name of the Selection Tree (in this case “Swordsman”) …/Game/Scripts/AI/Behaviors/Personalities/Swordsman/. Again, this is a very basic tutorial, but I hope it helps! Btw I didnt find any PipesManager.xml but Pipemanager.lua in that folder, anyway there is in it “specific Xml” so I did add the line as you did explain. You’re welcome. Yes, those are two separate methods to achieve similar goals (albeit with some differences). So you need to choose which one you prefer. Hi Seith , I did check lowercase\uppercase but really doesnt work. I m absolutely sure that I did follow the tutorial to the letter. What that seems strange for me is that I did never write Swordsman_idle or _approach etc so this “_” is from reference(it compares in Goalpipe and in luas)..anyway I m not able enough to correct the selection tree or other pro’s scripts etc so I’ll go straight to the other flowgraph way. Thank you! I have the same problem with your solution. Copy/pasted everything 1:1 and it still gives that error. I’m using the FreeSDK if that matters. I have fixed said error by renaming the behavior files, the goalpipe names, and the names in the selection tree names. That removed the error, but now I am getting “[Warning] AI: entity Grunt4 failed to change behavior to zombie_idle.” I have gotten this error with any custom AI I have used/ wrote. I am using cryengine free sdk 3.4.0 with a clean project. Can anyone point out what I am doing wrong? Let me make it clear. Name the goalpipes in GoalPipesSwordsman.xml to “swordsman_idle” etc. Next name the behavior files “SwordsmanIdle” etc. In the behavior files, they should both read “swordsman_idle” etc. Lastly, the Selection tree leaves should read “SwordsmanIdle” etc. Another problem I have is when using nav meshes inside buildings. They seem to always want to go outside and not follow me. When I’m outside they do follow me. Hi Alex. Well, this “tutorial” reflects the very little knowledge I had at the time, and it was far from perfect; I could never really get the AI to do exactly what I wanted. I have now moved on to Unity 4 and I’m not using the CryEngine anymore. So I’m afraid I can’t be of any help here, sorry. This melee system def works. I am not sure what anyone has done here. Maybe they did not switch the file type to lus. Because all my stuff was found and the debug log reports no errors. !! Cintiq Drivers Warning ! !